Opera browser was and still is considered one of the best browsers available for PC. However, with steady growth in the functionality of its major competitors, Opera users have started looking for alternatives. Opera is frequently compared to one of its major rivals - Chrome browser. So, which one is better? Both have their advantages and disadvantages, but how big is the difference? Previously Opera was a really unique browser, providing an array of features which were missing in other browsers. However, over time Opera could not keep up with Chrome in terms of page rendering and customization options. One of Opera’s weak points is the lack of extensions, which makes it less flexible and customizable. 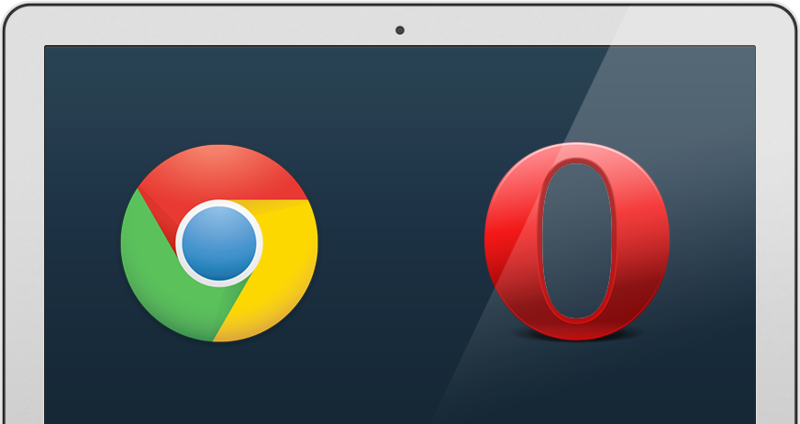 Ultimately, in 2013 Opera gave up its own engine and moved to Chromium, making the two browsers more similar. Despite having the same base, they differ much. Both browsers present users with a beautiful and comprehensive user interface. Opera focuses a lot on on bookmark management. It also has a unique Discovery section, which suggests some popular articles to read and news to check out. Opera has also retained its trademark Speed Dial feature. The Off-Road mode allows to browse the Internet even with slow connection. Though both Opera and Chrome are based on Chromium, Google Chrome still provides better support of modern web standards such as HTML5. This means that whatever page you load, it will open instantaneously, and each element will be displayed as it should be. Any web-based game will run smoothly, and there won’t be any trouble with playing online videos. Google Chrome has a lightning fast startup speed, which allows you to start browsing immediately after Chrome was launched. Thousands of free extensions are available for immediate download from the Chrome Web Store, so you can customize your browser's functionality and add almost every feature which is present in Opera and missing in Chrome. A key feature of Chrome, which is absent in Opera, is the use of Google Accounts. While using a Google Account, all settings, bookmarks, passwords, and extensions are synchronised via the cloud with the Chrome browser which you use on any other computer or portable device. This means that if you reinstall Chrome, or install it on another device or computer, you can log in using your Google account and get the very same Chrome you had before, with all your preferences and adjustments saved. This will work the same way as logging in with your Google Account on an Android device. Opera is not the only Chromium-based browser. While it tries to compete with Chrome mostly in looks and bookmarks, other Chromium-based browsers have much more to offer in terms of functionality. One such browsers is Citrio. Citrio has all the functionality of Chrome: the browser is as fast, stable, and secure as Google Chrome. However, if you want to use a browser that is more advanced than Chrome, you should consider Citrio. Citrio boasts download speeds that are several times higher than those in Chrome. Its powerful, built-in download manager allows users to resume broken downloads and organize downloaded files. Chrome has a higher download speed than Opera, but Citrio beats them both by speeding up downloads by up to 5 times. Citrio enables you to download online videos from almost any website, including YouTube, Vimeo, Instagram, and Facebook. With Citrio’s built-in bittorrent client it is possible to download both torrents and magnet links. The download manager in Citrio solves the problem of sorting downloads and keeping them organized in one location. Despite the fact that Chrome is one of the best browsers, there is a better alternative with a fresh new interface, unmatched functionality, and constant performance improvements. If you want a great browser, choose Chrome. If you want an even better one - go for Citrio.